Jeffrey Richards, John N. Hart Jnr., Jerry Frankel, Lou Spisto / Lucky VIII, Infinity Stages, Scott M. Delman, Jam Theatricals, Mauro Taylor, Rebecca Gold, Michael Palitz, Charles E. Stone, Will Trice, and Gfour Productions present, The American Repertory Theater production of THE GLASS MENAGERIE by Tennessee Williams at the Booth Theatre, Broadway, New York. THE GLASS MENAGERIE was Tennessee Williams' first success on Broadway. It was in 1944, and catapulted Mr Williams into the rarefied sphere of iconic artists, which he ably affirmed again and again, A STREETCAR NAMED DESIRE (1948, Pulitzer Prize) and CAT ON A HOT TIN ROOF (1955, Pulitzer Prize) were to come. Laurette Taylor, the original interpreter of Amanda, in that production, built a legendary aura around that role, and it has been, subsequently, the object for actors of a certain age, to pursue. On my last visit to New York I saw the Roundabout Theatre Company's production of THE GLASS MENAGERIE at the Laura Pels Theatre starring Judith Ivey (2010). I have seen this play by Tennessee Williams many times (I, once, played, Jim O'Connor) - how many more productions do I need to see? This production, from The American Repetory Theater, was first seen in Cambridge (Boston) earlier in the year and has come into New York onto Broadway at the famous Booth Theatre, trumpeted with superlatives. It's quartet of actors are Cherry Jones (two time Tony Award winner for Best Actress - THE HEIRESS and DOUBT) as Amanda Wingfield; Zachary Quinto (you may know him as Spock from the recent franchise movies STAR TREK and STAR TREK INTO DARKNESS) as Tom Wingfield; Celia Keenan-Bolger as Laura Wingfield and Brian J. Smith as The Gentleman Caller, Jim O'Connor. John Tiffany from the National Theatre of Scotland (BLACK WATCH) is the Director of this production. Bob Crowley has designed the work, Natasha Katz has created the lighting design, Clive Goodwin the Sound Design and Stephen Hoggett assisted with the movement - Sydney audiences may remember his work in the Sydney Theatre Company's co-production with Frantic Assembly of STOCKHOLM which he directed. All of these artists were involved in the Tony Award winning production of the musical ONCE - Best Director, Best Design, Best Lighting Design, Best Sound Design, with Mr Hoggett been Nominated for his movement work. The weight of the talent involved in this production of THE GLASS MENAGERIE is great, indeed. So, I went to this production on the expectation of great things, urged, particularly, by the New York Times' critic, Ben Brantley, who had reviewed the earlier Cambridge production performance, claiming that this 'work' was not merely a revival of this play but miraculously, for him, a re-invention of the play - almost a new play (his review of the Broadway production, of the 26th of September, is, still, just as stellar). Too, I had never seen Ms Jones on stage and was eager to place my estimation of her work alongside other great actors that I have recently seen (Cate Blanchett and Isabelle Huppert in THE MAIDS, for instance). Let alone to see Mr Quinto, so arresting as to re-make and claim Spock as his own, and to see him live, was going to be a treat, one way, or another. The claim by Mr Brantley that this production was so good as to make the play to be new and not just a revival (museum, or otherwise) and knowing that nothing of the original text has been altered made me dreadfully curious to see what was done in this collaboration, this production, considering the constant, recent alterations and fudging by some of our highly lauded artists in Sydney to the modern classic repertoire, which I have, personally found, trying. Simon Stone and DEATH OF A SALESMAN, CAT ON A HOT TIN ROOF, or even Andrew Uptons', adaptation of THE WHITE GUARD, for instance. Ralph Myers the Artistic Director of Belvoir Theatre is actually here in New York, to stage his production of PETER PAN - I hope he gets to see what a contemporary production of a classic play requires and how it can be done without re-writing. It seems to me two important things (there are others too, I guess), have been done, here. (Williams) work is a series of variations on the great emotional cycles of his own tortured life" and quotes Elia Kazan: "Everything in his life is in his plays, and everything in his plays is in his life"
All writers write what they know, and this play has been defined as a 'memory' play by the writer and it is definitely rooted in the grim social realities of the period of his early youth. Written in 1944, this is not Mr Williams first play, just merely the first that was universally praised. The era of this play remembered, then, is set close to the early 1930's - a time of great struggle for certain classes of American society, especially say, in the mid west, in a city like St Louis. It was during the Great Depression that Mr Williams left college to take a clerical job in a shoe company, (as does Tom) and even after entering the University of Iowa in 1938, the family's straightened finances still required him to hold onto a large number of part-time jobs. The Wingfileds of this 'memory' play have been deserted by the principal money earner, the father figure, and Amanda must find ways, along with the wages earned by Tom, to keep roof and kin together. That her only daughter, Laura, is suffering from a physical disability and a consequent pathological shyness, adds dramatically to the pressures on the relationships of all in the house. Tom, no less than Amanda. Amanda appreciates the poetic leanings and restlessness of her son and has a keen sense of her own older age approaching, and is increasingly desperate to find a way to serve her daughter to a means of survival. This production seems to capture all of the physical deprivations and desperations of the period of the play, and of this family. The careful choice of set dressing - properties - in the memory of this house, echo a genteel poverty. The spareness of the envisaged memory by Tom, of his old family apartment, as he is narrating this play, of limited, but obviously meaningful objects, give them, as well, a certain gravitas, for the 'poet' in him (and us), symbolism. What we see are the necessities - a small dining table with three wooden chairs. The only setting for the table is a simple candelabra - all else is imagined, even the food. There is a single lamp stand. A lounge. A telephone table. The only indulgences, a Victrola and a glass menagerie of ornaments that belongs to Laura (in this production, reduced to just one piece, the unicorn). The set design is three suspended simply dressed, carpeted, stepped platforms suspended over the abyss of a glistening black pool, with a climbing set of metal fire-escape stairs spiralling in a drastic shrinking perspective, into the sky- an exit up there is seemingly hopeless and formidable.The lighting is cool, only occasionally warm, romantic and/or sentimental. There is little pleasure in this apartment, just a barely passable patient respectability. Ms Jones is dressed in a practical, unflattering pale blue/greyish one piece ugly, period dress with flounced collar and very sensible shoes, and hand coiffed hair - there is no extravagance here. Even the costume she wears to welcome the outsider, the Gentlemen Caller, looks the worse for age - musty and drearily flounced. No attempt is given to display eccentricities and the hysterical romantics of most of the Amanda(s) I have previously seen - here is a straitened and practical, lone woman with family in the midst of the Great Depression. Full of duty to her family, son and daughter, especially, her daughter. This 'duty' is motivated, demonstrably, from a heart and soul full of love. In this production, Amanda (Ms Jones) - questions her daughter over her absence from Secretarial School, but it is no berating. It is enquired with an empathetic, if exhausting, understanding of Laura's problems, for Ms Jones has this Amanda dote on her with a deep, deep love and fear, giving a pouring of affection with masked looks as she sits close beside her, holding her gently around the waist. She quarrels with Tom, but, it is quarrelling that is anguished and patient, not of real rancour or permanence, hostile in the heat of the moment, but essentially a cry of care worn and care filled love. There is, from this Amanda, a kind of undertow of flirtation, with and for Tom, for every now and again, it seems Tom reminds Amanda of her long-gone husband, and she still can appreciate and long for that love of her life - her run-away-husband - that she refused to be warned against by her family, whatever he has now gone and done to her, and his family. Ms Jones' Amanda is definitely a 'romantic' sister to Mary Tyrone from O'Neill's LONG DAY'S JOURNEY INTO NIGHT, and Great Depression sister to Arthur Miller's recollection of his mother, Rose Baum, and Aunt Fanny in THE AMERICAN CLOCK. Women living through hard times and having to do it with a mother courage stoked by filial love. There is no wilful flirt with this Amanda, no real narcissist as I have mostly experienced her before in other productions, it is a simple woman/mother who was/is more comfortable in the past - a past of a little more affluence and security, than the present scarcity of means and tangible future. Tom Wingfield our narrator, 'inventor' of this play, as created by Mr Quinto, is recollecting an unbearable time/moments in his life. Moments that he has not forgiven himself for, that are full of pain, of guilt and good Christian angst. One that was the pivotal event in the future of his mother and, especially, his disadvantaged sister, and for himself. It is a memory that he contrives reluctantly for us, and as a poet, has to, necessarily recall. These memories seize him with agonising self bewilderment and cauterising guilt. This recall/memory is not a healing one. It is the revelation of an open sore, that when 'touched', emotionally, bleeds. It is a 'tender' memory, it is pitiable one, but, for Tom, it was an inevitable one, and, now in hindsight, was possibly, 'criminal'. After greeting us directly from the stage, Tom (Mr Quinto), moves towards the fire escape to begin this memory recall, tonight, and momentarily stumbles backwards, his body attempting to resist going to the memory. It grasps at him, tugs him into maelstrom of pain, and so he tells it, shows us that what is done is done, and demonstrates, even in his escape into freedom, that he is tethered with the clawing bonds of sorrow. This specific heightening of the given circumstances of the times of the play, in the design look and the character action of the play, is the deeply refreshing and illuminating providence of why this production of the play is so arresting. The second imposing quality of this production is the stylisation of the physical and vocal world of the family that Mr Tiffany and Mr Hoggett have created with these actors to propel the experience of the play into an extraordinary dimension. Tom introduces his family, himself first, and then, in this production, conjures Laura with a most magical moment, as his sister enters through the back of the central couch in a totally mesmerising shimmer of warm light (this motion/moment is book-ended in repetition, with her final exit, as well). Surprising and breathtakingly, simply, magic. Amanda is found 'gesturally' setting the dining room chairs and preparing the dinner table with imaginary cutlery and food. Mr Hoggett has developed a physical vocabulary for all of the characters, each have iconic gestures (Amanda's - a long raising of one hand in the air to clap with the prepared other at waist level, repeated significantly throughout; her hand slipping onto her breast underneath her dress collar, another trait.) The family 'memory' characters of the household 'dance' with each other entwining and being intertwined . It underlines the ritualised habits and daily-grind tasks developed by a family, so familiar with each other that no thought is necessary when they are together. This is choreography and not at all naturalism, and the actors have made it their own and dare to embrace it 150% - if one turned down the volume, took out the text, one could have a ballet. Each member of the 'memory' family, variously drift to the edge of the stage and lean into the reflected black pool that the suspended set shimmers on - contemplating the immense abyss of time and the possible alteration of what is sometimes elusive memory. So comfortable are the actors with this vivid stylisation, and so committed and daring are they, so consistent, that Mr Hoggett's and Mr Tiffany's drawing in these exaggerated physicalities, of the family in memory, is astonishing. Artists of a lesser calibre and courage would never had made it work - by itself, it is an outrageous conceit, but with this particular collective spirit of ensemble it is a masterstroke. When the real world in the form of the Gentlemen Caller appears, in the long scene seven of the play, the movement of all is subdued and almost naturalistic, Jim O'Connor the most real in gesture - a visitor from the outside world. Add to the physical layerings, the vocal traits: Ms Jones' Amanda is so careful, exaggerated in her articulation of every thought physically, that the realisation into the sounds to make the words, and collectively the speeches, become an observation of, perhaps, Tom's studied memory of Amanda, for, one can see the full stretched open mouthed prowess of an artist at work - jaw, lips and tongue - forming the southern lilt of her conversation, her sounds running a deliberate gamut of range, enhancing meaning and emotion, revealing character. Mr Quinto is just as clear, and, as his speeches are the principal 'poetic' voice of the play, the spectacular careful 'pre-seeing' of what he tells us is expedited with an immaculate vocal technique of precision and musicality. The dialect lilt is not Southern alone, it is more complex than that, it is a voice that seems to shift from his present one to his past one - time has intervened with this man/playwright. Ms Keenan-Bolger is muted and 'shy' in sound, painfully hesitant in its preparedness to commit, but has hints of a secret reserve of resilience. Jim ( an excellent Brian J. Smith) is confident, brash and firm - a confused and lost American dreamer in the midst of the Great Depression - attempting to remain faithful to the promise that his country says is there for his taking! This grading of the voices is studied, possibly from memory, by Tom, and is so, so subtly defining of character, and the aspirations of Mr Williams play. This is voice spoken, dare I say, as a kind of 'song'. In the context of this production I would, could, describe it as not as a 'musical' in its deliberateness, but, codified closer, in explanation, as 'operatic' in composition. 5. A commitment in performance of 150% ! 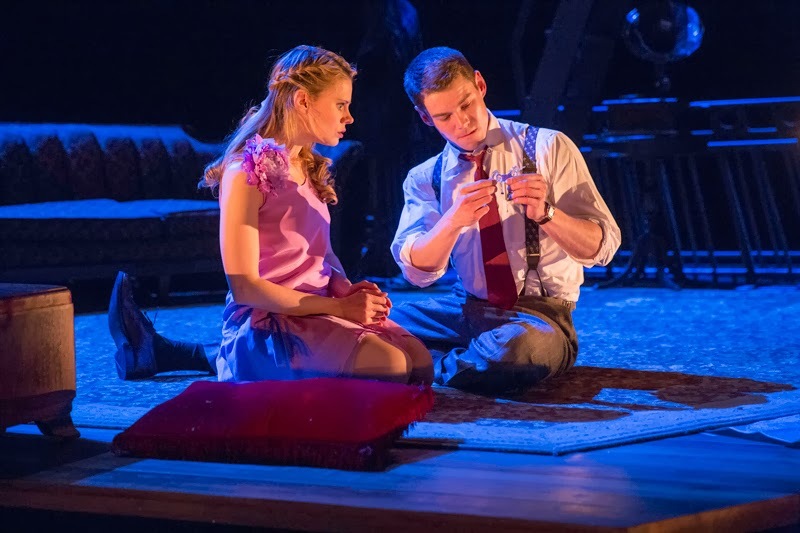 The stylisation of the choreography and musical composition (sound), accompanied by rigorous close reading of the text and the attendant given circumstances clues, lifts this production of that old chestnut THE GLASS MENAGERIE onto a plain of a new dimension. 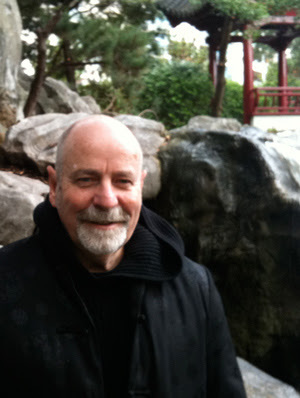 It allows, invites, discovery rather than old confirmations of the play. All the actors seem to be quivering with sensitive vibrations to and from each other in the ensemble, all know their part in this storytelling by Mr Williams and each knows how to slide their part into the jigsaw of the creative art they are participating in. This collaboration, by these artists, all elements, (not sure of the Music composition, though - not fragile enough, or, on the other hand tough enough, for me - Nico Muhly- errs on the side of sentiment in his orchestrations), shakes this well known play into a new way of seeing it. Nothing is lost in meaning or emotion in the receiving in the Booth Theatre, rather it is an exciting and tantalising new evaluation of the work, for those of us who know it, and, probably, an unforgettable one for first-timers, fulfilling the intentions of Mr Williams stated interests in theatre as "a plastic form". A classic and great, but, small gem of a play, gleaming with 2013 ownership by artists of remarkable perspicacity, discipline and courage.